Now you can have some nice Classic Tear Drop Earrings. 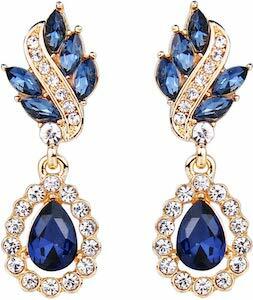 These earrings come in a nice gift box so that you can give them as a present too. These earrings have crystals and rhinestones which makes them nice and shiny and besides the blue version we show you they also come in different colors like black, red, green, white, and purple. Now you can have amazing looking jewelry for the special occasion but at a fraction of the price you expect to pay.